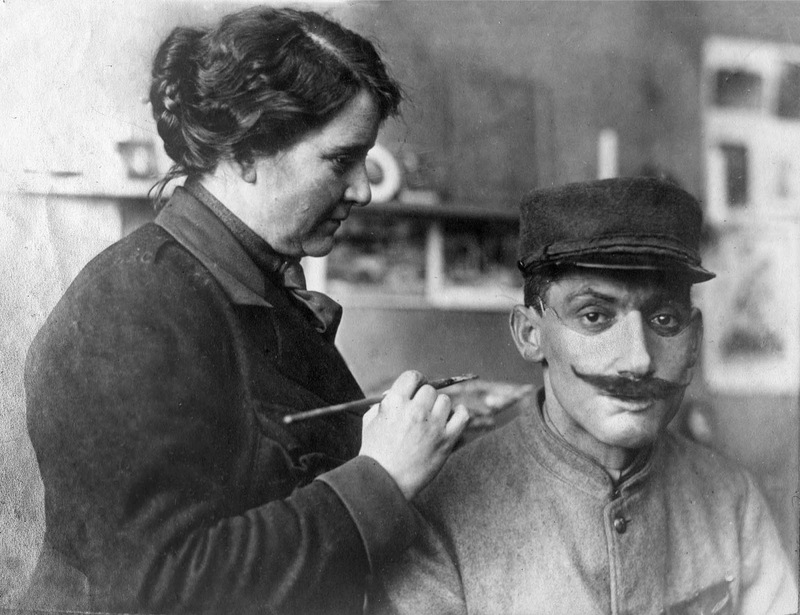 French soldier whose face was mutilated in World War I, being fitted with a mask made at the American Red Cross studio of Anna Coleman Ladd, 1918. 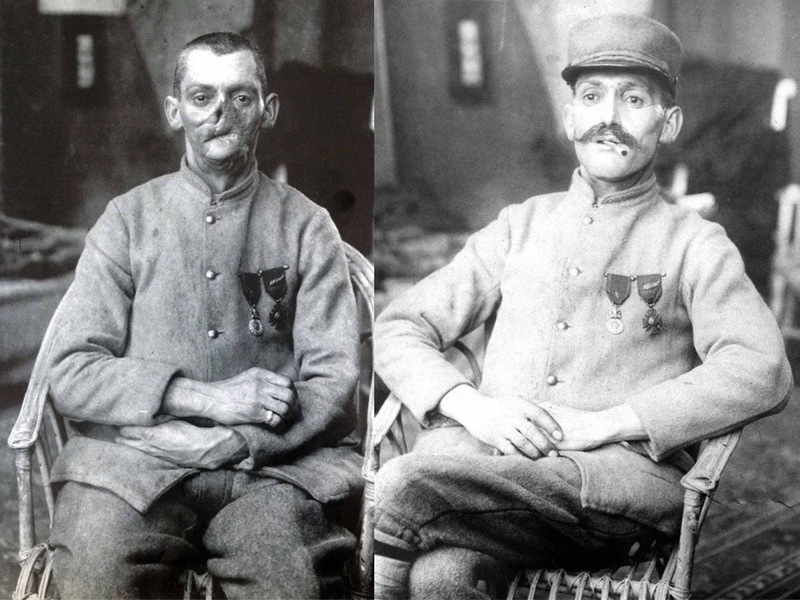 World War I caused the death of millions of combatants and civilians, while countless soldiers suffered from injury and disfigurement. 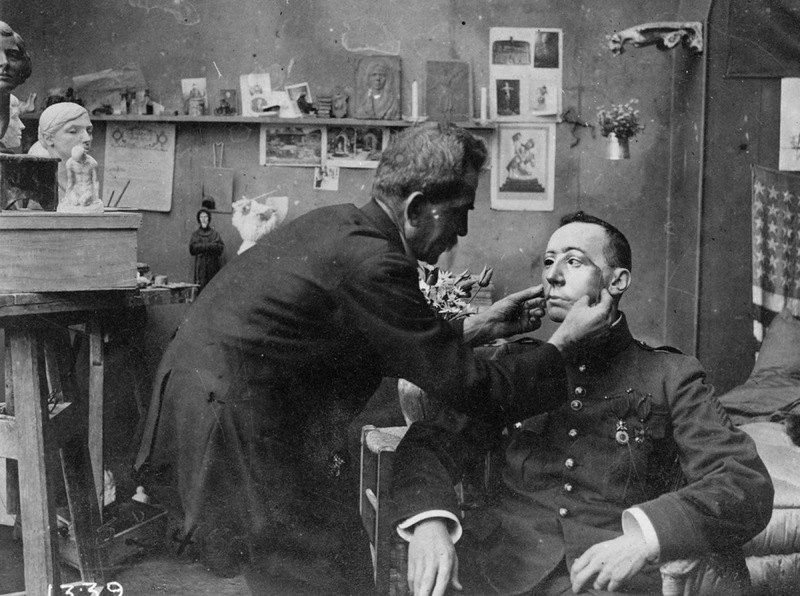 Perhaps the most disheartening were facial injuries, as soldiers had to not only deal with the physical loss, but also the constant psychological stress of wondering how people would react to their changed appearance. These men worried about their homecoming — how would strangers react, but more importantly how they would be treated by friends and family. Surgery and skin grafting was an option for some, but many sustained injuries that went beyond the ability of surgery to repair. 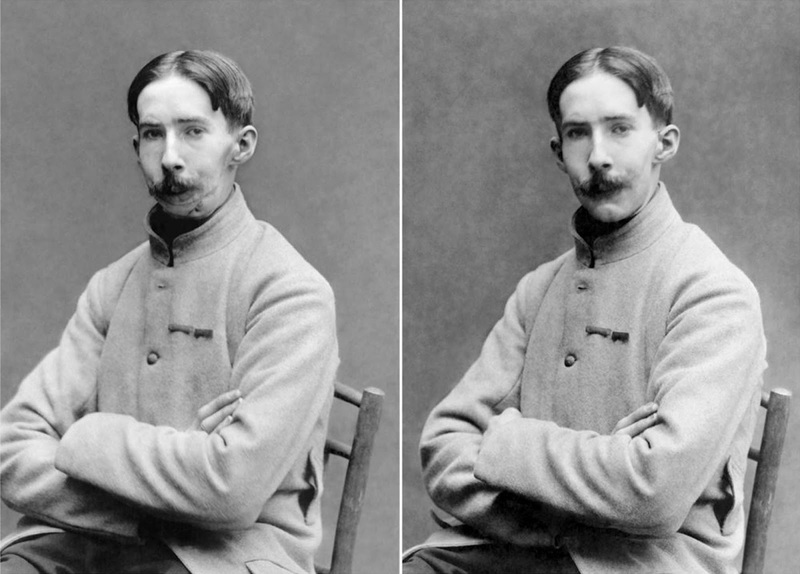 These unfortunate soldiers turned to portrait masks. Pioneered by English sculptor Captain Derwent Wood, and improved upon by American sculptor Anna Coleman Ladd, portrait masks were modeled from photographs taken before the injury and were painted in oils to resemble the former features of the patient. 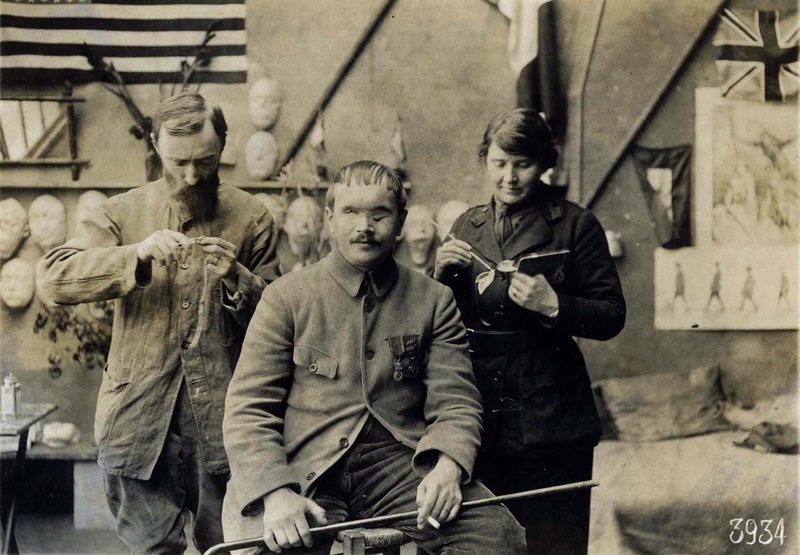 It started in 1917, when Ladd, who was then a sculptor and socialite living in Boston, read about the work of a sculptor who ran what was called the “Tin Noses Shop”, a mask-making studio for disfigured British soldiers. Inspired, Ladd set up her own studio in Paris and set to work sculpting new faces for those who had lost a piece of theirs in trench warfare. The top row of casts shows the first step in the process as these were molded from the soldiers’ disfigured faces.The bottom row of casts shows the molds with restorative work sculpted by Anna Coleman Ladd. A variety of portrait masks produced by Anna Coleman Ladd. Anna Coleman Ladd fitting soldier with restorative face mask. 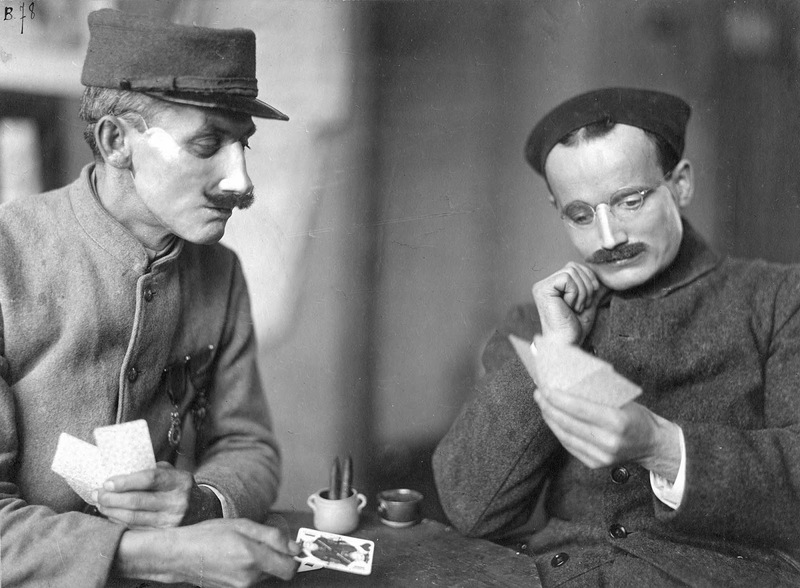 Two soldiers play cards while wearing Ladd’s handiwork. The first step, in the actual process of restoring a mutilé’s face, was to make a plaster cast of his damaged face. 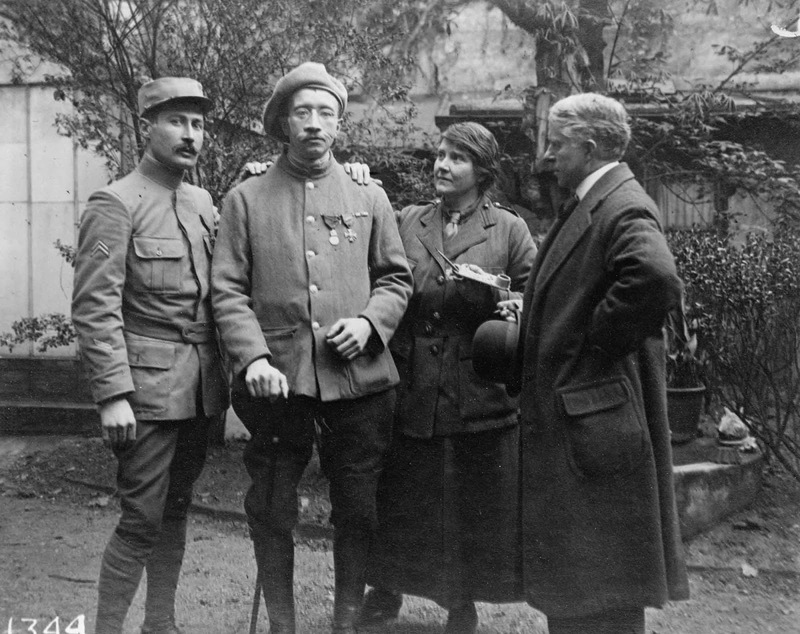 Then, using the information garnered from her interviews and photographs, Anna would build-up the missing or ruined features on the plaster cast until the soldier said, “C’est moi!” (It’s me!). Next a gutta percha (a type of latex) mask was made of the area that need to be restored. Some masks covered the whole face but most were partial masks, covering a chin and one cheek, or a nose and an eye, whatever had been damaged. The gutta percha mask was suspended in a copper bath for two days until a thin film of copper was deposited on it, resulting in a light weight copper mask that could be painted. Anna painted the mask while it was on the man’s face to better match his skin tones. If the disfigurement included the entire mouth, she would model the lips with space to accommodate a cigarette holder. There’s a short video from Anna Coleman Ladd’s shop. For those who desired, a moustache could be added. Anna Coleman Ladd took great care to produce masks that would allow men who gave so much for their country to return home as physically whole as possible. Most masks were held in place with spectacles but, if a soldier didn’t want glasses, Anna found alternative methods, like thin wire or ribbon, to secure the mask. In about a year and a half, Ladd and her colleagues sculpted almost 100 masks, each one a labor-intensive feat. The average cost of the masks was only $18 due, in large part, to the fact that Anna’s services were donated. When the war ended, the Red Cross couldn’t fund her studio anymore, so the studios closed. Ladd returned to Boston, where she resumed sculpting portrait busts and art for fountains. In 1932, the French Government made her a Chevalier of the Legion of Honour, in recognition of the work she’d done. The present day correlation to the work of Ladd is the field of anaplastology. Anaplastology is the art and science of restoring absent or malformed anatomy through artificial means. Before and after with the mask on. The part of the soldier’s body that was most vulnerable was his face, because if he looked up over a trench, that was the part that was going to be hit. Before and after. The mask was painted to match the skin color. 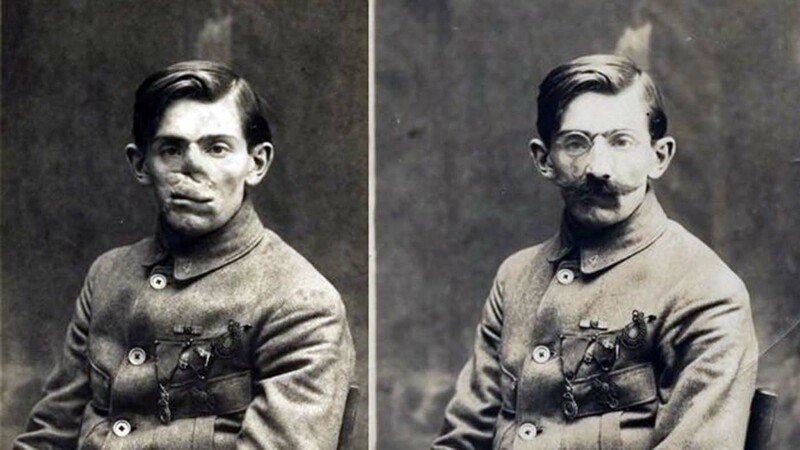 Ladd’s papers include these photos of a World War I veteran with and without his mask. Anna Coleman Ladd and her assistant working on a new mask. Anna Coleman Ladd and her life-restoring masks. I'm wondering if anyone is doing this type of work these days. I imagine there are disfigurements attained through warfare, accidents, etc. It would be interesting to know what plastic surgeons are doing for their patients. Remarkable. Just another amazing woman sho used her talents in a remarkable way for others yet history courses have repeatedly failed us in celebrating and acknowledging. Remarkable indeed...to restore someone’s face by creating a new one from humble materials is just the most amazing and loving thing I have ever seen. All for $18. She was a saint.